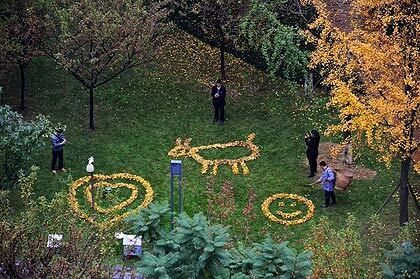 Ginkgo paintings created with a leaf rake! 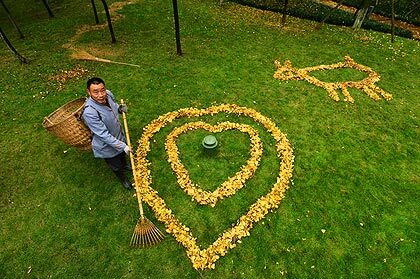 A 52-year-old sanitation worker gains local fame for creating art with fallen Ginkgo leaves in Chengdu, Sichuan, China. All lovely paintings made by this worker and his leaf rake! More and larger photos here. 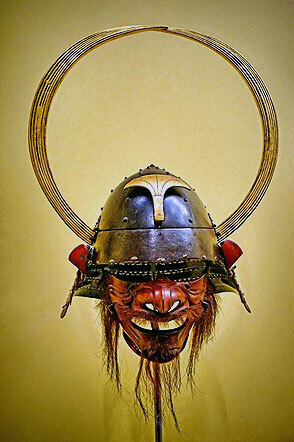 Gold lacquered Samurai helmet and half mask featuring a Ginkgo leaf-shaped crest, Japan 17th – 18th century CE. More info about crests on my website: Art-page. Armor in the Ann and Gabriel Barbier-Mueller Collection of Japanese Samurai Armor photographed at the Portland Art Museum. Last year I wrote about the great Ginkgo tree in Kobe, Japan, click here. The tree is said to be 500 years old, height 36 m, girth 11.2 m.
Location: Mizuho, Iiyama-shi, Nagano Prefecture. Now haruyuki onoue published a new video on YouTube of this tree that is so beautiful...enjoy!